The Colombian government and FARC guerrillas on Friday unveiled the independent mechanism they have negotiated for selecting judges for special peace tribunals, a process in which they will seek to enlist the participation of Pope Francis and UN Secretary-General Ban Ki-Moon. The agreement unveiled Friday in Havana, the venue for peace talks dating back to late 2012, mentions the designation of prominent figures and institutions that will be tasked with naming the members of the judge selection committee. The figures and institutions proposed by President Juan Manuel Santos‘ administration and the Revolutionary Armed Forces of Colombia, or FARC, are Pope Francis, Ban, the Criminal Chamber of Colombia’s Supreme Court, the International Center for Transitional Justice’s Colombian delegation and the Standing Committee of the State University System. 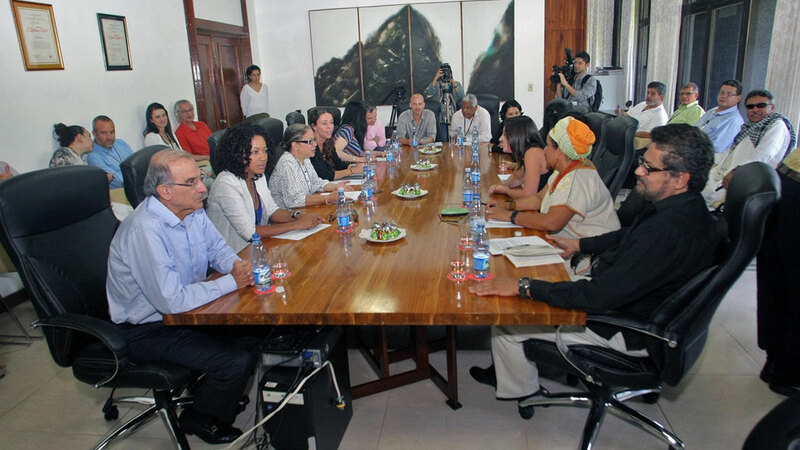 The negotiating teams in Havana announced on Sept. 23, 2015, the creation of a so-called Special Jurisdiction for Peace, a controversial decision that established a Tribunal for Peace and other judicial bodies. The Tribunal for Peace will be made up of 24 judges – 20 of them Colombian and four from other countries. A group of separate chambers to handle matters such as acknowledgment of truth and responsibility, amnesty and determination of legal status will be made up of 18 Colombian judges and six foreigners. These bodies will try those accused of war crimes and crimes against humanity, while “political crimes” or offenses of lesser severity will be eligible for amnesty. The Colombian government and the FARC announced a historic cease-fire deal on June 23, but peace negotiators are still working in Havana to resolve pending issues prior to the signing of a definitive peace agreement at a still-undetermined date. Those pending issues include loose ends of four other points on which agreement has already been reached: land reform, political participation, drugs and drug crop, and redress for the victims of the strife. Negotiators also are still discussing one final point on the agenda: implementation, verification and countersignature of the peace deal, which the Colombia government insists must be approved by popular referendum.